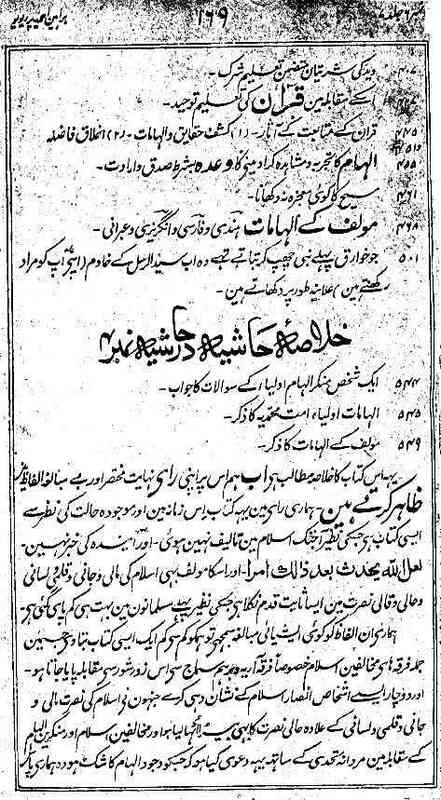 Maulvi Muhammad Husain Batalvi was a leader of the Ahl-i-Hadith sect, and editor of a journal Isha`at as-Sunna, who, from 1891 onwards, became a leading opponent of Hazrat Mirza Ghulam Ahmad after Hazrat Mirza claimed to be the Promised Messiah. However, earlier in 1884 when Hazrat Mirza's book Barahin Ahmadiyya was published, Muhammad Husain Batalvi wrote a very lengthy review of this book, highly praising the work. "In our opinion this book, at this time and in view of the present circumstances, is such that the like of it has not appeared in Islam up to now, while nothing can be said about the future. Its author too has been so constant in the service of Islam, with his money, life, pen and tongue, and personal experience, that very few parallels can be found in the Muslims. If anyone considers our words to be an Asian exaggeration, let him show us at least one such book which so vigorously fights all the opponents of Islam, especially the Arya and Brahamo Samaj, and let him name two or three persons who have supported Islam, not only with their wealth, lives, pen and tongue, but also by personal spiritual experience, and who have boldly thrown the challenge to all the opponents of Islam and the deniers of Divine revelation, that whoever doubts the truth of God speaking to man, he may come and observe it for himself, thus giving other religions a taste of this experience."